There is a lot of great information out there regarding the 74th Highland Regiment and Scottish Regiments during the American War for Independence in general. We will being posting interesting articles in this area and hope to update this page with as much new information as we can. So stop back some time! The kilt . . . an ancient and noble garment . . . remnant of the early Celtic race of Caledonia. These are some of the pervading attitudes that one might encounter at the various Scottish festivals and Highland Games around the country today. Of course, ask an Irishman, and he will tell you that the kilt was actually an ancient garment from Ireland and only later brought into Scotland by migrating Gaels, and moreover the Irish also invented the bagpipes, whisky, and whatever else you care to name. Ask an Englishman and he will tell you how Thomas Rawlinson, an English native, invented the kilt in the 18th century! Most of our ideas about the kilt are based on myth, legend, misconceptions, and (worse yet) Hollywood. Braveheart may get your blood up, but depict anything remotely like historically accurate clothing it does not. I will attempt here to present the reader with some hard, solid facts about just when and where the kilt was developed (and when and where it was not), focusing mostly on the early, pre-seventeenth century period. The majority of information used in this presentation can be found in the book Old Irish and Highland Dress by H. F. McClintock. This book contains more primary source documentation for Gaelic clothing (Ireland and Scotland as well as some on the Isle of Man) for early periods than any other source. It is a must read for anyone serious in the study of the Gaelic dress. It was originally published in 1943 by Dundalgan Press in Scotland, but had been long out of print and copies were hard to come by. Fortunately for us, it has been recently put back in print by Scotpress, here in the United States. There is a widespread belief that persists nowadays of the kilt being the traditional and ancient dress in Ireland, and only later introduced into Scotland. Let me say that no evidence of any kind can be found in the early Irish records to support this. McClintock has an extensive section in his book dealing with early Irish dress and nothing he includes can be said to be a kilt. Often times a writer trying to support this argument will point to one of the many stone carvings on crosses and monuments in Ireland that date before the 11th century and claim the figures are wearing kilts. In each of these cases, without fail, what is actually pictured is a leine, or Irish tunic. This may have a skirt reaching to the knee, but the skirt is simply the lower extension of the tunic and not a separate garment as the kilt is. This is in no way related to the kilt and cannot be said to be an early form of one. The reader is referred to my article on the leine for further treatment of this topic. 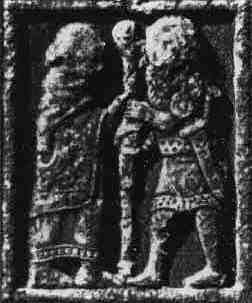 Pictured is a scene from the Cross of the Scriptures in Clonmacnois. The short tunic here is often mistaken for a kilt. Another source of confusion is the many figures of soldiers and knights wearing quilted armor. Various figures abound in Ireland (as well as Scotland) from the early Middle Ages of men in actons (called cotuns in Irish). These are long, heavy, tunics that have been quilted and padded and serve as a light armour. Often in the carvings the quilting is depicted with vertical lines running down the tunic. This is often mistaken for pleating, and since the actons reach the knee, they are often claimed to be representations of kilts. On such figures where the acton can be seen in full, however, it is painfully obvious that the quilting lines run all the way up the body and that the skirt is simply the lower part of a long tunic-not like the kilt at all. Their shirts be very strange. Not reaching past the thigh. As thick as pleats may lie. Whose sleeves hang trailing down. Almost unto the shoe . . . This is obviously a description of the leine (shirt) and not of any form of kilt. Nowhere, not once, has good solid evidence been presented to support the wearing of the kilt in Ireland. And only since the mid-19th century, at the absolute earliest, has it even been suggested that the kilt was early worn in Ireland. These were primarily Scottish writers trying to assert the antiquity of the kilt in Scotland, by saying it was brought over by the Irish Scotti tribe. Irish writers of the time never mention the wearing of the kilt at all. THE KILT IN MEDIEVAL SCOTLAND? Now we shall deal with the misconception that the kilt is a form of medieval dress. We can�t blame this on Braveheart , as the notion existed before its release, but the movie certainly did nothing to help matters. It depicts Scottish Highlanders (and Lowlanders) in the late 13th century wearing poor imitations of kilted garments from the 17th century and painting their faces blue with woad in good 2nd century fashion. Is it any wonder people are confused? Often when one goes to medieval reenactments and Renaissance Faires one will encounter men in very modern kilts with what are sold as "Jacobite" shirts. These people are simply believing what they have been told -that the kilt is a medieval garment-and accepting that at face value. I have even sat around one SCA campfire and been approached by a young man in full Highland Dress -modern Highland Dress. He was wearing a tailored tartan kilt, modern kilt hose, elastic garters, modern patent leather dress shoes, a white button shirt with a tartan tie, and Balmoral bonnet with his crest badge. He thought because it was Scottish that it was medieval. We cannot blame people for suffering from these misconceptions. It is what they have been taught by the poorly researched "myths" that pass for Scottish history. So let�s see what we actually do know to be fact about early Highland dress. The earliest entry in McClintock for Scotland is from 1093. He quotes a document called the Magnus Berfaet saga, in which King Magnus ventures to the Western Isles of Scotland and adopts the dress he finds there. "They went about barelegged having short tunics and also upper garments, and so many men called him �Barelegged� or �Barefoot.�" Those wishing to prove the early existence of a kilt almost always cite this document, but nowhere in the document is a kilt mentioned. People overly willing to sacrifice fact for their desire to date the kilt to antiquity jump at the fact that these men went barelegged and make the assumption that if they were not wearing trousers then they must have been wearing a kilt. But this assumption is completely invalid as the kilt is mentioned nowhere in this document, and the clothing that is mentioned consists of a tunic and an upper garment which corresponds perfectly with the contemporary dress of the Irish Gaels of the time-the leine and brat. The next mention of Highland Dress we get from McClintock is from the 16th century. Let me stress that nowhere is there to be found evidence to suggest the wearing of any form of kilt in Scotland in the time period before the 16th century. People may claim various early dates for the wearing of the kilt, but I have yet to see hard evidence for it. Most often what people are claiming to be a kilt is merely a depiction of a leine, tunic, or acton. The type of kilt that we will begin to encounter in the 16th century is called (in my poor Gaelic) a feilidh-mhor (great wrap), a breacan-feile (tartan wrap) or simply a belted plaid. All refer to the same garment. I prefer the latter for ease of use. A plaid or plaide is a length of heavy woolen fabric worn over the body like a mantle or a shawl. It has nothing to do with the modern American usage of the word plaid, except that they were often of a tartan pattern, which "plaid" is synonymous with in America. A belted plaid is simply a very long plaid that had been gathered into folds and belted around the body. It is often called in modern reenactment circles a "great kilt." Despite what you saw in Braveheart the belted plaid was not worn in the 13th and 14th centuries. The belted plaid costumes worn in that movie were not even very good representations of the belted plaids. I honestly do not know how the costumers could have claimed to have done any historical research-they simply designed a garment that they thought looked both Scottish and medieval. Their clothing was made for use (being chiefly suited for war) and not for ornament. All, both nobles and common people, wore mantles of one sort (except that the nobles preferred those of several colours). These were long and flowing, but capable of being neatly gathered up at pleasure into folds. Their ancestors wore plaids of many colours, and numbers still retain this custom but the majority now in their dress prefer a dark brown, imitating nearly the leaves of the heather, that when lying upon the heath in the day, they may not be discovered by the appearance of their clothes; in these wrapped rather than covered, they brave the severest storms in the open air, and sometimes lay themselves down to sleep even in the midst of snow. This document attests to the rugged constitution of the Highlander, and the fact that the plaids were used as protection from the elements and a form of camouflage as well as a mode of dress. Since it refers to plaids and seems to indicate a tartan pattern, many eagerly assume this is a kilt or belted plaid. But such an assumption would be invalid as no form of pleating or belting is mentioned and all of his descriptions are equally valid of an unbelted plaid (i.e. a mantle or brat) which we know to have been worn with frequency. The truth of the matter is that only one document has yet been found that dates from before 1600 and without a doubt describes a belted plaid, the earliest form of the kilt. It is an Irish source, written in Gaelic. In the Life of Red Hugh O�Donnell written by Lughaidh O�Clery, we read of a group of hired mercenaries from the Scottish Hebrides, employed by O�Donnell in 1594. These were recognized among the Irish by the difference of their arms and clothing, their habits and language, for their exterior dress was mottled cloaks to the calf of the leg with ties and fastenings. Their girdles were over the loins outside the cloaks. Here we have the first definite mention of the belt being worn around the outside of the mantle-the hallmark of the belted plaid. And it is clear from the context of the description that it was also definitely not an Irish mode of dress and was characteristic of the Scots among them. It may be possible that the belted plaid was worn or at least in development some time prior to this description, but the hard fact remains that this is the first proof we have of its existence and anything earlier is mere speculation. Keep in mind that McClintock describes 10 mentions of Highland dress in Scotland prior to this in date and of those 10 only the two mentioned above contain anything that could remotely be suggestive of a belted plaid. If the belted plaid was being worn with any regularity I think these other writers would have made at least passing mention of it in their descriptions of Highland dress. The earliest picture we have of a belted plaid comes from after 1600. The exact dating is uncertain but it would seem to be from the first decade of the 17th century. And there are ample 17th century references to the belted plaid so we know its use became nearly universal among the Gaelic Highlanders. When trying to recreate one of the first belted plaids from the late 16th century, it is necessary to extrapolate from what we know of the garment from later times. We know is was untailored. It consisted of a length of woolen material or a linen-wool blend, most often of tartan pattern (although solid colors were worn as one 1635 portrait of a Campbell chief attests to--he is wearing a solid red belted plaid). The length would appear to have been between 4 and 5 yards (although there is evidence for a range of between 3 and 6, perhaps 7). One will often hear it repeated that the plaids had to be at least 9 yards. Often it is 10, 12 or even 16. In fact, I have seen one web page where the author suggests a length of 30 yards--that is 90 feet of heavy woolen material! It seems there is no limit to the excess of people's imaginations. The "9-yard" myth has its foundation in the records of the 17th and 18th century that show where often 8 or 9 yards of tartan are purchased for the making of a belted plaid. What one needs to realize is that this material was only about 25" to 30" wide, and the plaid had to be wide enough to reach from the knees to above the head. So two widths of material would be sewn together to get a 50" to 60" width. Therefore 9 yards of tartan material would make a plaid 4.5 yards long. This corresponds with the earliest surviving tailored kilts we have, which all contain about 4 yards of cloth. Certainly 5 is enough for a man of any girth-too much for some. I will go into some detail here of how to put on the belted plaid. Beware of any who tell you "This is the authentic way it was done - period!" People love to take a little bit of knowledge, act like the expert, and tell everyone where they need to be corrected. If you go to Highland Games, Renaissance Festivals, or reenactments you will find all manner of people who can tell you that the way you wear your kilt is wrong and the way they wear theirs is right. Forgive me if I say they are all bunk. I am one of the few people who can claim to wear the kilt professionally and even I have people approach me with corrections. The truth is that we have absolutely no idea how people put on the belted plaid. What we have are scant descriptions of how they looked and were used when worn, and pictures of people wearing them. Nowhere do there exist written instructions on how it was put on. Imagine if you will living in some future time when everything is fastened with Velcro. You work at a museum of 20th century clothing and you are trying to tie the shoelaces on a pair of reproduction sneakers. You have pictures of the way people tied their shoes in the 20th century, but no written instructions. No one wrote down how to tie his or her shoes because everyone grew up learning it at an early age. The same is true of the belted plaid. All we have to go on are the pictures. Any way we can put on the plaid so that the end result looks like our documentation is a valid method. Most likely they had a variety of ways of putting it on themselves depending on time period, local custom, and personal preference. Here is one way. Begin by laying your material out on the ground. To start, you may find it easier to lay it all out neatly, but once you get used to doing this, you will not need as much room-you will only need to spread out the section you are currently pleating. Gather the center part of the plaid into folds or pleats. This does not need to be neat, precise pleating as in a modern tailored kilt. Think of it more as being roughly gathered and you will have more authentic looking kilt. The end goal is to reduce the 4 or 5 yards of material to a length about 1.5 times your waist measurement. You should aim to have a section of gathers or folds approximately the length of half your waist size in the center, with unfolded sections of equal length on either end. Since these folds are not sewn in, they can always be readjusted later. Precision is not something needed when folding your plaid. Lie down on your plaid. I will frequently have people tell me at this point that it just seems silly to suggest that the Highlanders would have lain down to get dressed. But keep in mind that these plaids were also used as sleeping blankets and the wearer would have more than likely been laying in his plaid already. I will point out that it is possible to don your belted plaid while standing, which I have done before myself. But the standing method is difficult at best when done alone--it is easier done with someone's help. As many of us do not have personal attendants to help us dress, the laying down method works the best. You will need to lay down on your plaid, body parallel to the pleats, so that the lower edge hangs about your knees. Whether it is above, below, or on your knees is personal choice. 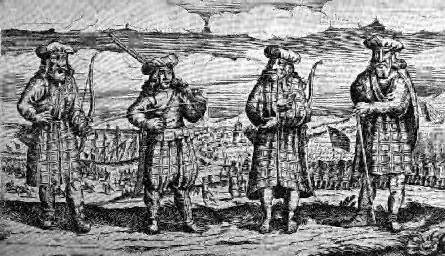 There does not appear to have been a standard length as this woodcut of Scottish soldiers from 1641 clearly shows. Wrap the two unpleated ends around you. It is suggested that you overlap them left over right. There is no historical basis for this but it is the way modern kilts have always overlapped. You will need to take a sturdy leather belt and run it around your waist at this point and fasten it well. If you have anything hanging from your belt such as a dirk (knife) or sporran (pouch), make sure it is on your belt before you do this. Every description I have read of how to put on the belted plaid starts off with having the wearer lay out his belt first upon the ground and then pleating his material out on top of the belt. I do not know why people suggest this. It is more difficult this way and there seems to be no reason for doing so. Once you have the belt fastened, stand up. You are now wearing the belted plaid. You will notice a large amount of material overlapping your belt and hanging down around your legs. This material can be arranged around your upper body in any number of ways, depending on the climate and activity level of the wearer. The illustration above shows some good examples. It is suggested that the front two corners be pulled around behind your back and tucked in to the belt at the base of the spine. This will create pockets and allow easy access to your sporran. The remainder behind you can be pulled up over your head or shoulders in the cold or rain, or left trailing behind in heat. It can be pulled up and tucked into your belt, forming a large bag for carrying. Most often part of it is drawn from the back onto the left shoulder and part drawn up under the left arm across the front and pinned together. This will create a large bag under the left arm, and is quite striking in appearance. The functions of this garment are many and varied! But remember when wearing it that the primary concerns are that you are comfortable and covered. Other than that, feel free to experiment with different ways of arranging it and find one that works well with you. Just a few quick notes on how this large wrap became the kilt of today. I will only touch on this briefly since this takes us well out of the early period. One story commonly repeated is that an Englishman named Thomas Rawlinson opened an iron-smelting factory in the Highlands around the year 1730. His workers all dressed in the belted plaids, which proved too hot and cumbersome for close work in his factory. He solved the problem by cutting the garment in half. The lower part could now be worn separately and the upper part discarded when coming indoors. This is considered proof that an Englishman invented the Scottish national dress. The problem with this story is that we know of numerous illustrations of Highlanders wearing the only the bottom part of the belted plaid that date long before Rawlinson ever set foot in Scotland. Remember that the belted plaid consisted of two widths of material stitched together. If one neglects to stitch the two together, and only the bottom 4 yards are worn, pleated and belted around the waist, the resulting garment is called the feilidh-beag (little wrap). The word is often spelled in English "phillabeg." I will not go into detailed evidence of the wearing of the phillabeg here, but I will say that there is some suggestion of its use in the late 17th century, and it was definitely being worn in the early 18th century. It most likely came about as a natural evolution of the belted plaid and Rawlinson probably observed it and quickly deduced its usefulness in his situation and introduced it among his workers. The first instance we have of the pleats being sewn in to the phillabeg, creating a true tailored kilt, comes in 1792. This kilt is in possession of the Scottish Tartans Society and is currently on display at the Scottish Tartans Museum of Franklin, NC. It contains 4 yards of tartan, and has wide box pleats that are each sewn in. This is the first garment that can truly be called a kilt in the form we know it today. The tailoring and style are different from a modern kilt, but it is a kilt nonetheless, with its origins in the belted plaid of the late 16th century. One cannot discuss the history of the kilt without also discussing tartan. Though the notion of a "clan tartan" is a modern one, far outside any historic period, this question needs to be addressed for there are many misconceptions regarding tartan among reenactment groups. The quick answer to any question about pre-industrialized tartan is wear what you want. You should be more concerned over whether the colors could be obtained with natural dyes available in the area than what the specific pattern is. Clans and families simply did not have any identifying tartans in this early period. When do we first find tartan in Scotland and just what is a tartan anyway? The word "tartan" itself probably derives from the French word tiretaine (the Gaelic word for tartan is breacan). This word most likely was introduced to Scotland sometime in the sixteenth century, when Scotland was dynastically linked to France. Tiretaine was a linsey-woolsey cloth (a woolen-linen blend). This word referred to the fabric itself, and not to any particular type of design. It�s uncertain when it occurred, but after some time the term "tartan" came to be applied specifically to the pattern of interlocking stripes known in America as "plaid." The word "plaid" itself comes from the Scots word "plaide" which referred to the large wrap garment worn in the Highlands from the late 16th century to the late 18th century that consisted of about 5 yards of tartan cloth, approximately 60 inches wide, wrapped and belted around the body-the belted plaid or feilidh-mhor . The earliest evidence we have of any tartan (hereafter used to mean any cloth of interlocking stripes) being worn in Scotland is the Falkirk Tartan, so named for the town it was discovered in. This is a small sample of tartan material showing a simple dark and light check, a design also known as a "shepherd�s plaid." This small remnant of material is estimated to be from around 250 to 325 AD. This by no means is the earliest known tartan in history. One finds tartan patterned cloth almost wherever a culture had the technology to weave. Recent excavations in Mongolia reveal Caucasian people wearing tartan patterned clothing that date to over 5000 years ago! Some have pointed at this as proof that clan tartans have a pre-historic dating, but this is simply not the case. Tartan was worn originally in Scotland as a fashionable type of dress. All tartan was, of course, hand woven and each weaver would take it upon him or herself to create unique and attractive designs based on the colors of dyes available. Certain colors may have been more common in certain regions, but there was nothing to prohibit someone with money from importing various dyes. Certain pattern schemes may have been more common in one area than another, but nothing approaching modern clan tartans could be said to have existed. Imagine talking to a hand weaver of tartan, a craftsman and an artist, and telling that person that you wanted them to weave the same pattern of tartan in the same colors for everyone in the region (regiment, clan, etc.). That pattern was set in stone, could not be varied from and was to be the only pattern woven for that clan. Of course they would never have taken such commands! Tartan was and still is an art form and individual weavers created a wonderful variety of tartan designs. Plus there is simply no reason to associate the type and color of dress with a person's family or clan. If we found an early Spanish portrait of a man in a red shirt named Hernandez, we would never assume that all Hernandez's wore red shirts! But this is just the assumption that we so often make for Highland Dress in Scotland. By the 16th century, when we begin to see the earliest type of kilted garment (the belted plaid), tartan had become characteristic of Highland Dress. 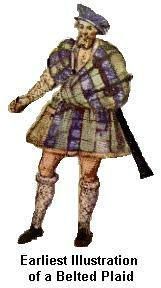 Gaelic speaking Highlanders wore tartan of bright and flashy shades to show off wealth and status. They also favoured darker, natural tones that would emulate the shades of the bracken and the heather so that they might wrap themselves in their plaids and be hidden. But the colors chosen had more to do with what dyes were available to them (either locally or that they could afford to import) and personal taste than any clan affiliation. By the time of the Jacobite rebellions of the 18th century, tartan fashion had become truly outstanding. Surviving tartan from this period include yellows, purples, golds, greens, oranges, reds, blues, and any number of other bright colors, woven in ever more intricate patterns. Often more than one tartan would be worn at once. Meanwhile, in the Lowlands, tartan shawls (also called plaids) were worn favouring more simple, black and white designs. When the massacre at Culloden left the Jacobite forces in ruin, tartan (along with Highland Dress in general as well as bagpipes) was proscribed. 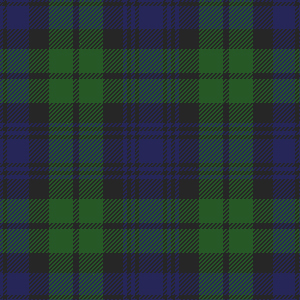 It was not clan tartan that was being outlawed, but rather tartan as a symbol of Gaelic Scottishness. The end of the Jacobite rebellions also saw an end to the clan system in Scotland. It was not until after Proscription was repealed some 32 years later that the notion of clan tartans really began to form-after any effective clan system had been broken and Anglicized. The first regular, standardized tartans were woven by Lowland weaver William Wilson, owner of the woolen mill William Wilson & Son�s of Bannockburn. Wilson was the first commercial, industrial producer of tartan material. On his mechanical looms, he could repeat the same pattern of tartan over and over again without fail. In fact, with industrial looms, it is easier to set the looms to reproduce the same patterns than it is to constantly change them to make different designs. He at first assigned these patterns numbers, but it was not long before names began to be associated with them as well. I suppose it had as much to do with salesmanship as anything else. By assigning the name of a romantic clan, local city, or popular ruling family to a tartan, Wilson could increase his sales. Of course, a Highland Scot would pay no mind to all of this. Just because his name was MacDonald, it did not mean he had to purchase a kilt in the tartan that bore that name. He would buy whatever tartan he wanted. But the notion that each clan had its own identifying tartan fit in well with 19th century thought. This century was a very Romantic time, and notions of "tradition" and "antiquity" had a strong grip on the people. Writers like Sir Walter Scott added to Scotland�s romantic appeal and soon tartan was all the rage in England as well. A MacDonald of Scottish descent, whose family had been living in England, or the United States, for several generations, might want to reconnect with his Scottish roots. So he goes to purchase a kilt, and when he sees a tartan with the MacDonald name, he will buy it, as his "clan" tartan, not knowing any better. Everyone of Scottish descent wanted to know what "their" clan tartan was. Queen Victoria loved all things Scottish and insisted when visited by any Highland chief that he be wearing his clan tartan-even if he didn�t have one! Even though this system of clan tartans was still very new, the myth already existed that it was somehow ancient. People assumed this was a traditional practice, and they were more inclined to change history to suit their views than to change their views to suit history. Soon "experts" arose to travel the country with lists of names placing people into this clan or that one, and telling them what their "ancient and traditional" clan tartan was. Some of these name lists were based on historical associations between families, variations of name spellings, geographical proximity, and often just the fact that they sounded similar. Tartan books were written, often with little or no supporting evidence. This is the beginning of our system of "clan tartans." To some this is discouraging, but it does not change the fact that today many Scottish clans and families (as well as towns, businesses, and districts) are validly represented with a particular tartan-some 200 years old, some 2 years old. Tartan is as much a part of Scottish tradition as anything else. But when creating a historic garment for use within an early reenactment group, do not get caught up in the tartan craze. Remember that the belted plaid predates the standardization of tartan and have fun with it!